My Ironheart journey began on April 4, 2012. From Parker, Colorado, I was on a family vacation in Monterey CA. That morning I went out on a run, as I was training for my first half Ironman later that year. I had briefly stopped to see a sight along the boardwalk on which I was running, and then took a few steps to restart my run. This is where my life would change. I dropped dead at that moment after suffering a massive widow maker heart attack. I was blessed that day by the fact that there was a vacationing nurse only steps away. She immediately stepped in, assessed my situation and began CPR, continuing until paramedics arrived and took over. They were able to restart my heart with multiple shocks from an AED. I was transported to the Community Hospital of Monterey Peninsula where I would be cared for over the next couple weeks. Meanwhile back at our hotel, my wife Sarah, and daughter, Abbie, were growing impatient as my short run was now reaching two hours, and we had plans for the day. Eventually, Sarah said something had to be wrong and pulled out the yellow pages searching for hospitals. Her first call was to CHOMP, and to her horror, they confirmed that they had an unconscious “John Doe” runner that had been brought in and was in critical condition. (Reason to always wear a Road ID). Over the next day I was stabilized and put into a hypothermic coma, to protect my brain function, although my daughter thought I was turning into a vampire. Two days later I was warmed up and brought back, and much to my surprise, I woke up, in a hospital surrounded by family that was not on this trip with us at my last memory. On day seven, I underwent quadruple bypass surgery. It was in recovery that I knew I would recover from this and be better than ever. My recovery ICU nurse, Shannon, was also a triathlete so we had a lot to talk about over the next twelve hours, which at times were the most miserable of my life as she made me roll on my side, and worst of all, giving her a cough, which felt as though my sternum was being ripped open all over again. It was with her that I went on my first walk, which was supposed to be a few steps. I kept it going to complete a full lap of the cardiac ward, about 100 yards. It was also on this walk that I told her that I was still going to be an Ironman, to which she replied, “baby steps, and you will get there.” Over the next four days of recovery I continued to get stronger, working up to walks of five laps, several times a day. I was released four days post surgery, however, but was required to stay in town for the next ten days before I would be cleared to fly home. We were blessed to have met new friends during my hospital stay, who were family of one of my college friends who I was to visit the day of my heart attack, who took us into their beautiful home in Carmel, CA. Over that next week, I continued to challenge myself, walking the path of the 17th and 18th holes at Pebble Beach and back, and much to the horror of the visiting in home nurse, down and back up a flight of eighty stairs, leading down to the valley bellow our temporary home. Back home in Colorado my life consisted of walking a few miles a day, taking naps and then beginning cardiac rehab. I didn’t really fit the mold of the others in my cardiac rehab class, as I was often scolded for “pushing the limits a bit much” on my first few classes. As the sessions continued I was given more freedom to push myself under monitored conditions. At the six week mark, I was given the go ahead to start riding the bike again, and on that day celebrated by riding a wonderful twenty four miles. Two months later, and just four months since my surgery, it was time to put the training to the test, and, yes, with my cardiologists’ approval, I returned to triathlon. I completed an Olympic distance triathlon to this day is still a pretty challenging course. Over the next months, I continued to work hard and improvement followed leading up to an event that will always be close to my heart. That next summer I returned to Monterey, CA and competed in the Olympic distance Pacific Grove Triathlon along with my inspiring ICU nurse, Shannon. I also had the opportunity to spend some celebratory time at the hospital with all the great people who took such good care of me the year before. Over the next two years I competed in numerous events including, Ironman Kansas 70.3 as well as other sprint, Olympic and half IM events, leading up to my end goal. August 2, 2015 was the day I was able to fulfill my ICU declaration, and compete in my first full Ironman, Ironman Boulder. I had a great day and exceeded almost all my expectations that day finishing in 13:O9. 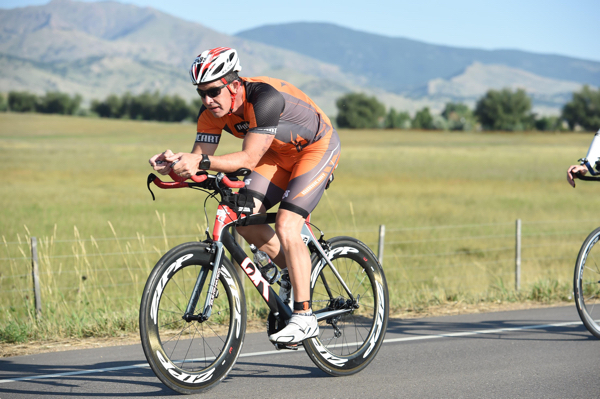 During my recovery three years ago, I first found out about Ironheart Foundation, and felt this was a group that I wanted to be a part of, as many of these amazing athletes shared stories similar to mine. The initiatives that they support go hand in hand with what I have been through, such as the AED project, placing defibrillators in places of need. It was also a great feeling to know I wasn’t alone in overcoming heart disease, and that all my goals were achievable, as the group was currently preparing for Ironman Arizona and the filming of “HEART: Flatline to Finish Line.” Through Ironheart, I have developed many friendships and bonds that will last forever, as we are all connected at the heart. This next summer of 2016, I am so excited that I will be teaming up with a group of Ironheart athletes to compete in the Ragnar Trail Relay- Cascades, in Washington. I look forward to this, as I will be able to spend time over the two-day event with some of my teammates with whom I have developed bonds with over the years, but never had the opportunity to meet in person.